NIH MedlinePlus Magazine Winter 2018 Issue Available Online! The Winter 2018 issue of NIH MedlinePlus Magazine is now available! Featured in the issue is Emmy and Golden Globe award-winning actor, Jim Parsons. Parsons recently produced and narrated First in Human, a Discovery Channel documentary series that followed four patients at the NIH Clinical Center. He discussed his experiences visiting NIH and learning directly from NIH researchers and their patients with NIH MedlinePlus magazine. The issue also features articles on the next frontier in antibiotic resistance, the future of total knee replacement surgery, fighting sickle cell disease, and NIH teaming up with public libraries for the All of Us Research Program. NIH MedlinePlus the Magazine is the free, trusted consumer guide to the vast array of authoritative online health and medical information in MedlinePlus. Published four times a year, the magazine showcases the National Institutes of Health’s (NIH) latest medical research and healthcare information. 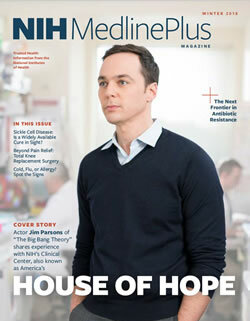 NIH MedlinePlus the Magazine is available online in both HTML and PDF format. You can also receive a print subscription or e-mail alerts. 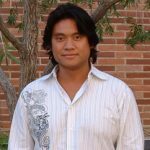 Marco Tamase is the Member Services Coordinator for the Pacific Southwest Region of the National Network of Libraries of Medicine located at UCLA.